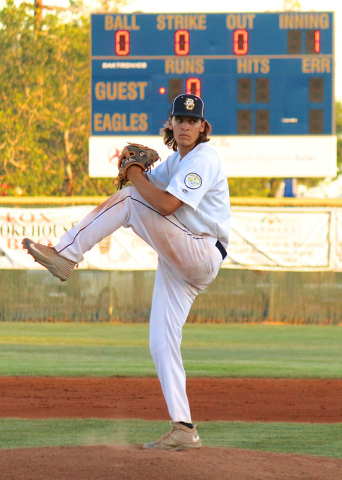 Junior Boulder City High starting pitcher Jake Hubel is rarely seen as the ace of the Eagles’ deep pitching staff. With that honor going toward heralded seniors Peyton Koopman and Steve Wagner this season, Hubel wasn’t often called upon in do-or-die moments by head coach Bobby Reese to propel the Eagles to a victory. When his moment came, however, the emerging junior was ready. With Koopman starting in the Eagles’ 13-1 victory over Clark and Wagner starting in the Eagles’ 5-2 victory over Spring Valley, Hubel was left to face off against the top seeded Division I-A Sunset opponent Faith Lutheran in the Eagles’ third outing, far from an easy task. Despite being off from pitching duties for nearly a month, with his last start coming against Palo Verde on April 18, Hubel looked liked a seasoned veteran May 12, throwing a complete game against the Crusaders in a crowd littered with Major League and collegiate scouts. Allowing seven hits and three runs, zero of them earned, Hubel struck out three batters over the seven-inning contest, while getting a run batted in each from Koopman and Wagner at the plate and juniors Kodey Rahr and Preston Van Diest. The Eagles won 4-3. Holding off Sierra Vista 5-1 on Saturday to capture their first regional championship since 2011, the Eagles cruised through the Mountain Lions, where they’ll be the No. 1 seed starting today in Reno. Flexing his muscles as the team’s ace, Koopman struck out 12 Mountain Lion batters in his six innings of work, in which he allowed no hits and walked only three to give the Eagles a four-game postseason sweep. Sparking the Eagles’ postseason run early on was senior Austin Wishard, who provided the Eagles with their most clutch hit of the season, smacking a three-run home run on an 0-2 pitch May 11 with no outs in the bottom of the 11th inning to top the Grizzlies 5-2 and move the Eagles into the winner’s bracket. In a postseason filled with late-game dramatics, big game heroics and a near no-hitter by Koopman, the Eagles are peaking at the right time heading up to Reno. With a senior laden core ready to breakout, the Eagles are hopeful that this is their year to hang their first state championship banner since 2006. The Eagles will start their state tournament appearance against Northern Nevada opponent Churchill County at Galena High School this afternoon.